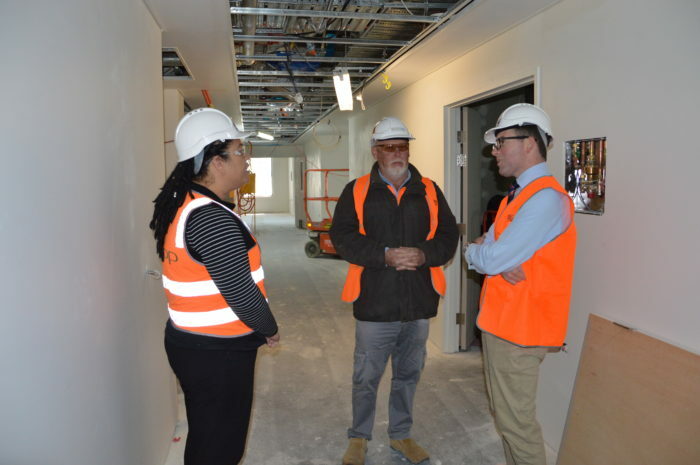 Northern Tablelands MP Adam Marshall inspecting the first floor of the new four-story Armidale Rural Referral Hospital with APP Project Manager Simeon Townsend and Richard Crooks Construction Site Manager Robert Stanborough. WITH construction at the fit-out stage across all floor levels of new Armidale Rural Referral Hospital, Northern Tablelands MP Adam Marshall was delighted when given the opportunity this week for a site inspection and progress report. Mr Marshall said the four-storey building, which will house the hospital’s new emergency department, critical care unit, in-patient wards, operating theatres and sterilising unit, was progressing at a great rate of knots. “The internal fit out of the four floors has begun in earnest and, in about three weeks’ time, the external scaffolding will come off the building as the brick work will be completed,” Mr Marshall said. Mr Marshall said it was great to get a look at an amazing state-of-the-art facility which the community will soon be able to see and enjoy. “This is very exciting, it’s a once in a generation opportunity to completely revolutionize and modernize health care, not just for Armidale but the entire Northern Tablelands region,” he said. “This hospital is getting busier and busier as our population grows and it is an important health service hub for our whole region. “A lot of other centres feed into Armidale and that’s why this redevelopment is so essential. It will cater for growing demand for health services in our region for next 20 or 30 years and also change the way those health services are delivered. Mr Marshall said the palliative care facilities in the new building were very impressive and the level of care and comfort palliative care patients and their families will now have could never have be provided in the existing hospital. “This new facility will also give other communities, like Inverell, a lot of confidence about the standard of construction they can expect to see in their own town in the not too distant future,” he said. “This is a $60million redevelopment is not only about a brand new four storey building – there’s a lot of refurbishment work that will start very soon on the existing hospital to complement the new facility. “By providing high quality facilities, our region will be able to attract the doctors and specialists it needs to help close the gap in regional health.